Grass-leaved sweetflag (Shichangpu)-Acorus gramineus Soland. Botanical Name: Acorus gramineus Soland. Part Used & Method for Pharmaceutical Preparations: The rhizomes are dug in early spring and cleaned and dried in the sun. When the fresh rhizome is used for medical purposes, it should be dug in late summer. 1. Unconsciousness due to blockage of the pericardium by turbid phlegm or accumulation of dampness and heat. Grass-leaved sweetflag (Shichangpu) is used with fresh Bamboo juice (Zhuli) and Curcuma root (Yujin) in the formula Changpu Yujin Tang. 2. Dampness blocking the middle jiao (spleen and stomach) manifested as stifling sensation, distension and pain in the chest and abdominal region. Grass-leaved sweetflag (Shichangpu) is used with Tangerine peel (Chenpi) and Magnolia bark (Houpo). 3. Damp-heat blocking the middle jiao manifested as dysentery and vomiting after meals. Grass-leaved sweetflag (Shichangpu) is used with Coptis root (Huanglian). 4. Insomnia, forgetfulness, tinnitus and deafness. 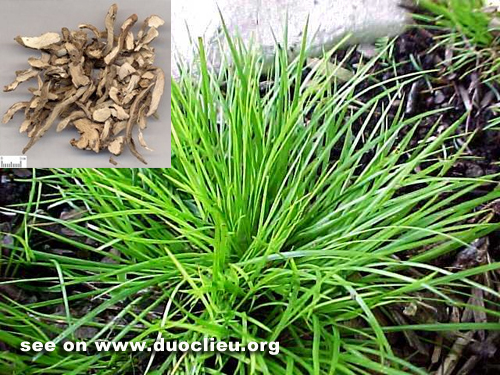 Grass-leaved sweetflag (Shichangpu) is used with Polygala root (Yuanzhi) and Poria (Fuling) in the formula Anshen Dingzhi Wan. Dosage: 5-8 g (double dosage for the fresh herb).